This part is no longer available. It is part of the Mechanism assembly which is our part 237147. 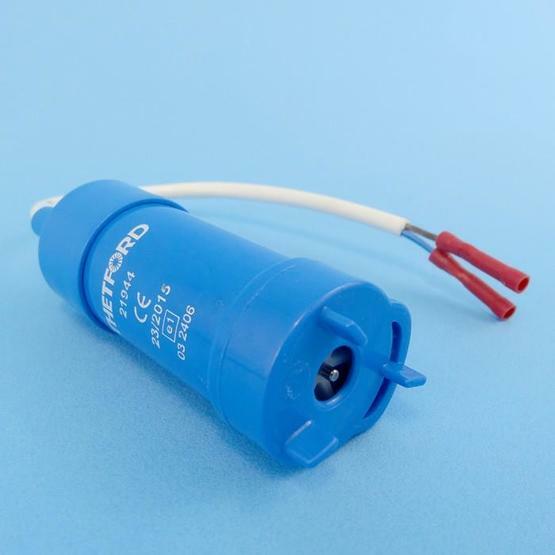 This new assembly includes a blade fuse instead of the glass fuse. The basic problem that you have is likely due to a faulty water pump, our ref. 229418. which will need replacing. 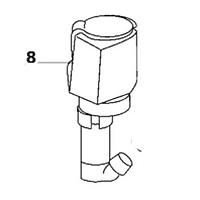 The pump is found underneath the toilet roll holder which will lift out. You most likely have a faulty water pump in the toilet and this will need to be replaced. Our ref 129418. Sorry, unable to advise on your lack of hot water to tap. You will need to check the pipework. My Cassette C200CWE will not start this year. I had to renew the 3amp fuse and power is getting to toilet. Almost certainly a problem with the water pump inside the toilet. It may be that the rotor is stuck. If not you will need to replace it. Our ref 229418. Hi, my thetford c200 toilet used to flush but the led didn't illuminate when nearly full. I purchased a new thetford led and still no joy, it actually overflowed. Now the fuse keeps blowing as soon as the flush is pressed. It fans been about 3 weeks and dried out but the fuse still boles straight away. Can you help? You appear to have two problems here. 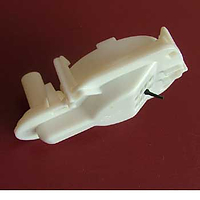 A faulty water pump is the probable cause of the fuse 'blowing'. Replacement water pump, our ref. 129418. The overflow problem is likely to be a faulty reed switch which is the item that senses the waste water level. this is our ref. 130062 but this may be the part that you have already purchased. Hello , we have a 1993 lunar meteorite and need to replace the water pump in the thetford toilet. On the pump it says Reich 12 V We have looked at your web page but need help in deciding which one is the right one for us. Could you help , please ?. How do I determine if the switch is bad or if the pump is bad on a c2 cassette toilet. I have already checked the 3 amp fuse and it was broken so I replace it. The toilet will not flush. If the 3 amp fuse was broken then it it almost certain that the pump is faulty. The pump is beneath the toilet roll holder. 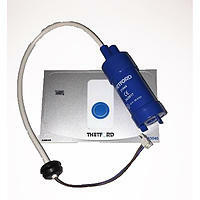 You will need to undo a screw to remove the pump and then cut the electrical wire and remove the water hose. Strip back the wire and connect the pump directly across the battery to check operation. If you purchase a new pump it comes complete with electrical connections and heat-shrink sleeving so that you can connect the new pump and fit the sleeving to seal from the water. Make sure you slide the sleeving onto the wire before making the electrical connection. I have an Avondale Landrange 6400 1996 model fitted with an electric flushing Thetford cassette toilet. The electric flushing has stopped working. All the fuses are OK in the caravan. How do I strip it down to get to the motor to see if the motor is U/S? Is this a common fault? We put the caravan into storage with the flush working and first time out it wouldn't work. Any advice would be appreciated. I believe you have a bench type toilet in your caravan and not the swivel bowl type. in this case the water pump is underneath the toilet roll holder to the right of the pan. This holder will lift out to give you access to the water pump which should be held in by one screw. You will need to cut the wire leading to the pump to remove. The new pump comes with connectors and heat shrink sleeving. Hi Tom,I have a thetford c402 c/x cassette toilet.When I press the flush button the fuse blows. Thetford porta potti. Not flushing. we have changed the fuse but still no joy. Any ideas please? how do I get to the switch so that I can replace the 12v pump on my c2 cassette? The 12 volt toilet pump is underneath the toilet roll holder which will lift out. By removing a single screw the pump can be lifted out. The electrical wires have to be cut and the new pump installed using heat shrink sleeving to cover the electrical connection. I am not sure which switch you are referring to. 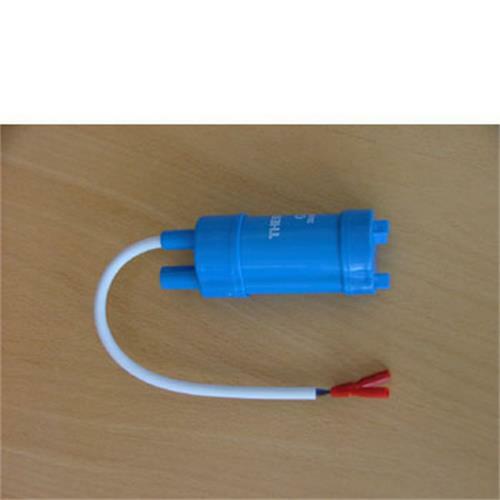 If you have checked the fuses it is likely that the electric pump has failed and will need to be replaced. Remove the blue operating button to access two screws. Remove the screws and lift the assembly ( held only by mastic ) to access the switch and pump. Before changing the pump make sure that you have continuity through the switch when depressed. If no continuity then the switch may be at fault. If you do have continuity then replace the pump. Replacement pump is our part 229418. Replaced the old pump in the toilet as it had intremiten fault,the new pump is a direct replacement,all sorted now very happy. No problem with delivery, arrived promptly and all necessary parts supplied to install the pump. My only comment is about design. The electrical wire would benefit from being 200 mm longer such that the connection can be made outside the tank in my model. Other than that the pump works, time will tell if the cable connection causes problems? having trouble with our flush system so initial attempt to rectify matter was to buy a new pump. This has been attached and works fine. Problem is we cannot fit it back into compartment. Thetford problem, not yours! The electric flush had stopped working, following the caravan being in storage over the winter. 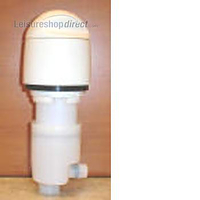 Investigations revealed that the pump was (probably) seized, so I ordered a replacement from leisureshopdirect.com. This was a painless, easy process and the item arrived promptly. Step-by-step instructions are included. It was a relatively straightforward process of removing the old pump and attaching the new. The only bit of equipment we needed which we didn't have was a heat gun, this is used to melt the rubber tube to seal the wiring connection. 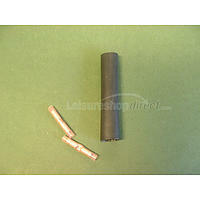 We soon obtained a heat gun and the repair was completed - the toilet electric flush is working once again. 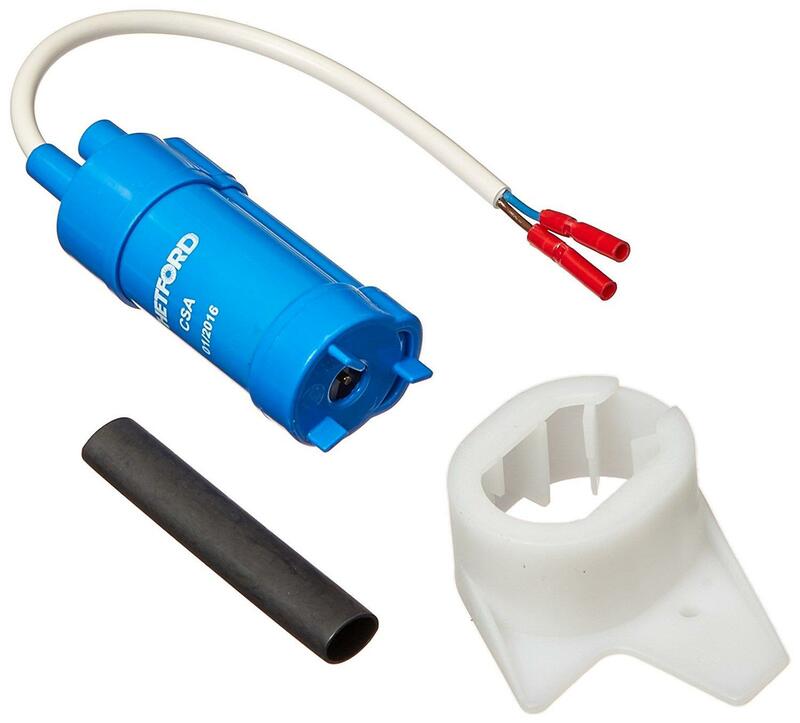 Excellent replacement pump kit. Much stronger flush than the old one (which was original from 1991!). Delighted with prompt & helpful service from Leisureshop. The pump is the one required but, as yet, I haven't been able to fit it as my caravan is stored in France. 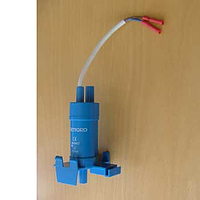 Please see review for Thetford Bezel; Bezel and pump are excellent products with complete and thorough pictorial instructions, very easy to replace. Excellent. Comes with full instructions. Genuine Thetford Spare. Needed as original pump was a bit hit and miss when being used. Could have done with slightly longer cable but OK.
Easy to replace old water pump. Excellent service with part turning up very quickly after ordering. These pumps will seize through lack of use so it was good to find a source of replacements. The speed of delivery was impressive. Easy to replace old water pump with instructions from leisureshop website. Excellent service with part turning up 24hours after ordering. 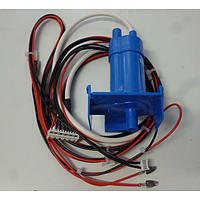 Thetford Cassette Water Pump For C200/CWE. I bought this pump to replace one which had ceased working. Although the description of the product is for a different model of toilet, it does in fact fit the one in my description, ie: C200/CWE The instructions included in the product packaging refer to another model of Thetfordl toilet. The instructions for the C200 model are available elsewhere on the Leisure Shop website. 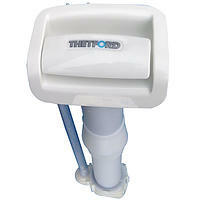 The Thetford C200 CWE toilet 12volt water pump change was technically easy using the Thetford information on this website, but is practically difficult due to the small aperture through which you have to work, especially if you have big hands and forearms. Take care when crimping the new connections as the metal is quite soft. The pump worked perfectly on completion. The exploded diagram showed me the location of the pump, after that it was easy, the new pump and clamp fitted like a glove. I did decide to use self amalgamating tape to seal the electrical connection as it was easier than using the heat shrink sleeving supplied. I have never replaced one of these pumps before we live in our caravan full time so a lot of items wear out quite quickly but this pump has taken 5 years to breakdown. I didn't know that the wiring was under water so I was filled with trepidation as how this could be achieved. Everything was in the package to do the job I heated the heatshrink with a mini blowtorch constantly moving the flame, this was a successful operation I hope it lasts another 5 years. Have not had chance to use it yet - weather freezing cold. Delivery excellent. The pump arrived very quickly, only delayed by the weekend. So very easy to fit. In my case the holding clip was not required. Fitted in a matter of minutes. Arrived very quickly, fitted but didn't cure problem, so now replacing switch.